Biochar is the carbon-rich product which occurs when biomass (such as wood, manure or crop residues) is heated in a closed container with little or no available air. It can be used to improve agriculture and the environment in several ways, and its persistence in soil and nutrient-retention properties make it an ideal soil amendment to increase crop yields. In addition to this, biochar sequestration, in combination with sustainable biomass production, can be carbon-negative and therefore used to actively remove carbon dioxide from the atmosphere, with potentially major implications for mitigation of climate change. Biochar production can also be combined with bioenergy production through the use of the gases that are given off in the pyrolysis process. The first edition of this book, published in 2009, was the definitive work reviewing the expanding research literature on this topic. Since then, the rate of research activity has increased at least ten-fold, and biochar products are now commercially available as soil amendments. 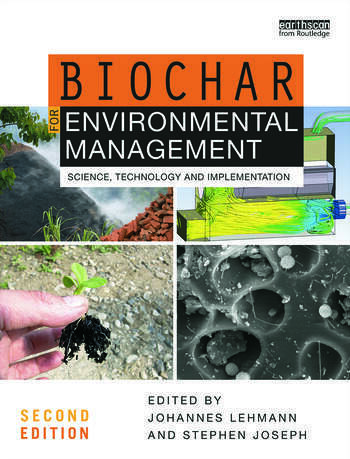 This second edition includes not only substantially updated chapters, but also additional chapters: on environmental risk assessment; on new uses of biochar in composting and potting mixes; a new and controversial field of studying the effects of biochar on soil carbon cycles; on traditional use with very recent discoveries that biochar was used not only in the Amazon but also in Africa and Asia; on changes in water availability and soil water dynamics; and on sustainability and certification. The book therefore continues to represent the most comprehensive compilation of current knowledge on all aspects of biochar. Stephen Joseph is a visiting professor in the School of Materials Science and Engineering at the University of New South Wales, Australia, and Co-founder of the International Biochar Initiative.